Khan (1847-1943). Fazal Dad was a Minhas Rajput from Chakwal area. Glancy (later Punjab governor) had close relationship with Fazal Dad. army and all were polo players. the office. His wife and son also perished in the same crash. (E- in-C) of Pakistan Army. literature from Punjab University. He was enrolled at Oxford. London and travelled widely giving lectures on psychoanalysis. two found unsuitable and one died. joined new war time raised 40th Cavalry as Second Lieutenant. due to his service with mule companies of service corps. Singh Chimni as Quarter Master General (QMG). Sind area and on 1 January 1948, it was re-designated 8th Division. Quetta sub area re-designated 52nd Brigade in September 1948. Officer. I have great confidence in him’. Volume 29, No.1, Spring 2012. Colonel Gautam Sharma. Nationalization of the Indian Army – 1885-1947. 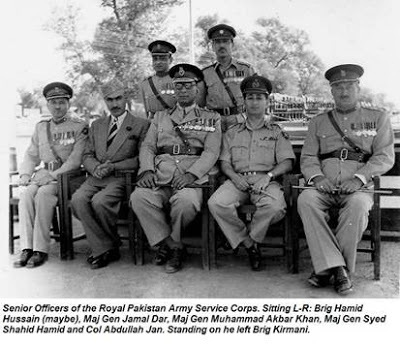 In the first decade after independence in 1947, several officers of Pakistan army were given rapid promotions. Officers with same names resulted in some confusion. Two Akbars and two Latifs were frequently confused. Two additional officers named Akbar served in different times. One was Khan Muhammad Akbar Khan, commissioned in different times in 1905 from Imperial Cadet Corps (ICC). He was attached to Malwa Bhil Corps. These were limited commissions only for Native Indian Land Forces (NILF). These officers could not command British soldiers and either served with state forces or attached as orderly officers to senior officers. He faded away and nothing much is known about him. Another officer named Akbar Khan was from Punjab regiment. He commanded 105th Independent Brigade in 1965 war. He was Director General (DG) of Inter Services Intelligence (ISI) from 1966-71. In 1971 war, he commanded 12 Division. He rose to the rank of Lieutenant General and served as Karachi Corps Commander. He was superseded in 1976, when General Muhammad Zia ul Haq was appointed Chief of Army Staff (COAS). Akbar the senior – PA-1 Muhammad Akbar Khan. His career dealt in detail in previous piece. Akbar the junior– Akbar Khan (1912-1994) was a Pathan from Charsadda area of Khyber-Pukhtunkwa. 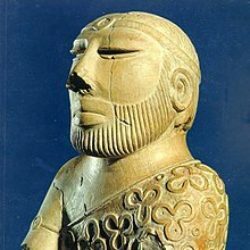 He was from the pareech khel clan of Muhammadzai tribe that inhabits the village of Utmanzai. Akbar was from the last batch of Indian officers commissioned from Royal Military College Sandhurst in February 1934. Lieutenant General B.M. Kaul was his course mate at Sandhurst and they became friends during their service. Officers commissioned from Sandhurst were called King Commissioned Indian Officers (KCIOs). Akbar joined 6/13 Frontier Force Rifles (FFRif.). This battalion is now One Frontier Force (FF) Regiment of Pakistan army. He fought Second World War with 14/13 FFRif. (now15FF). This was a new war time battalion raised in April 1941, at Jhansi. In new war time raised battalions, officers and men were posted from different battalions, usually from the same group. Lieutenant Colonel Arthur Felix-Williams, DSO, MC of 1/13 FFRis. was the first Commanding Officer (CO). There were fourteen officers in the battalion and Akbar at the rank of Major was the senior most of the four Indian officers of the battalion. Lieutenants H. H. Khan, Fazl-e-Wahid Khan and A.K. Akram were other Indian officers (Wahid won MC). Battalion was part of 100th Brigade (other battalions of the brigade included 2 Borders and 4/10 Gurkha Rifles) of 20th Division commanded by Major General Douglas Gracey. 14/13 FFRif. was one of the few battalions well trained in jungle warfare and performed admirably. Battalion received three DSOs and 14 MCs. This included two MCs to Viceroy Commissioned Officers (VCOs); Subedar Bhagat Singh and Subedar Habib Khan. Battalion was patrolling about 1000 square mile area and many detachments were not in contact with battalion HQs. 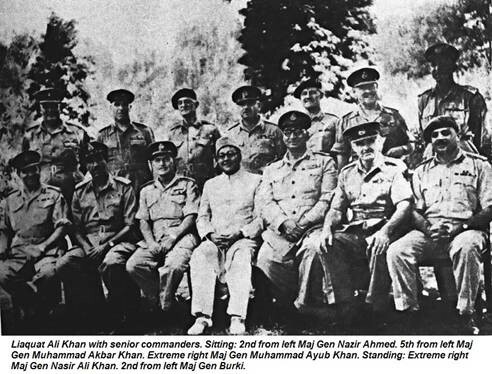 Akbar was commanding two companies (B & C) during Irrawaddy crossing and was quite independent in his command due to poor communications with battalion HQs. Battalion’s defenses fought against the onslaught of Japanese and suffered forty six killed and more than 100 wounded. Akbar withdrew his two companies into the lines of 9/14 Punjab Regiment. Akbar fought very well and won his Distinguished Service Order (DSO) in June 1945. 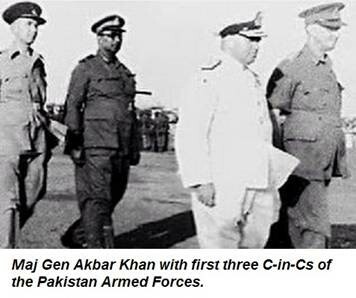 At the time of partition in 1947, Akbar was the only serving Pakistani officer with DSO. The most decorated Muslim officer inherited by Pakistan was now retired Captain Taj Muhammad Khanzada. He was from 5/11 Sikh and had won MC, DSO and bar. The most unusual aspect was that he had won DSO at the rank of Captain. DSO was usually awarded to Major and upward rank. 5/11 Sikh was captured by Japanese and many including Khanzada joined Subhash Chandra Bose’s Indian National army (INA) and was removed from the service. Khanzada’s battalion mate was Harbakhsh Singh who stayed away from INA. In 1965 war, Harbakhsh was Lieutenant General commanding western command of Indian army. In September 1947, Colonel Akbar was appointed first deputy director of Weapons & Equipment (W&E) directorate. He got involved with Kashmir operations when he was appointed military advisor to Prime Minister. He used code name Tariq during Kashmir operations. He was given the command of 101 Brigade based in Kohat. He moved his brigade from Kohat to Uri sector in Kashmir. In addition to his own brigade, Akbar was also coordinating activities of the tribesmen operating in Kashmir. He commanded 101 Brigade from April 1948 to January 1950. After Kashmir operations, 101 Brigade was moved to Sialkot. In 1950, he attended Joint Services Staff College course in London. He came under suspicion of British authorities when he met some communists in London. This information was passed on to Pakistani C-in-C General Gracey who already knew about Akbar and some other officers and called them ‘Young Turk Party’. In December 1950, he was promoted Major General and appointed CGS. Several officers involved in Kashmir operations were upset at the ceasefire and this resentment evolved into talk about overthrowing the government. 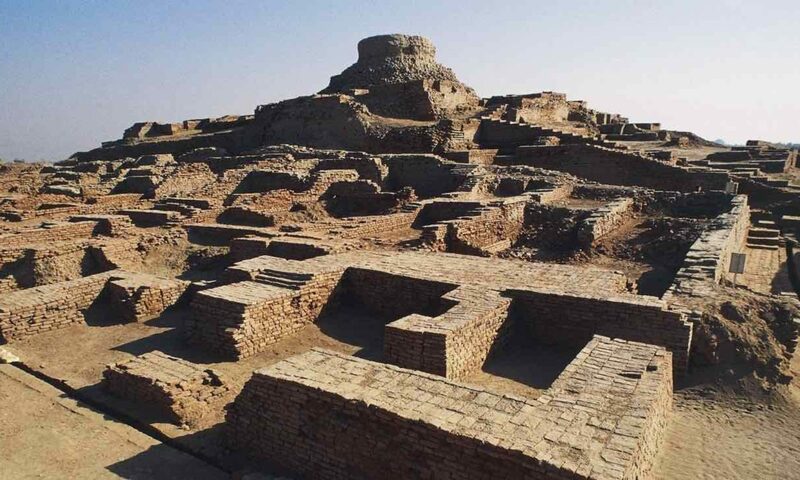 Akbar took advantage of these sentiments and became the leader of the conspiracy. In March 1951, he was arrested along with several other officers. A special tribunal convicted and sentenced him to five years in prison. He was released in 1955. He joined Pakistan Peoples Party and served as Prime Minister Zulfiqar Ali Bhutto’s national security advisor. Akbar was married to Nasim Akbar. Nasim was a social, educated lady from a very affluent family of Lahore. She had leftist ideas and it was alleged that Akbar was under the influence of his wife. Nasim was an ambitious woman and allegedly aspired to become the first lady. Nasim was present in some of the meetings of the conspirators but she was not charged with any offence. In fact, many officers were upset when Akbar brought some civilians including his wife into the loop. The couple divorced in 1959. Akbar has been a controversial figure in Pakistan army history. Some leftists believe that if Akbar had succeeded in 1951, Pakistan army would have been pushed into the ‘left lane’. Seven years later, Ayub Khan’s coup decisively put army and the country in the ‘right lane’. Akbar was well respected by his juniors for his professionalism, gallant performance in war and ease of interaction with juniors. On the other hand, he had a mercurial temper and at times behaved in a bizarre way. Several incidents are narrated as evidence of this bizarre behavior but two examples will suffice. When he was major general, he used to keep a rope at his office table declaring to visitors that some people need to be hanged with this rope. In February 1972, when he was national security advisor of Prime Minister Bhutto, there was strike by policemen in Peshawar. Akbar phoned commandant of school of artillery at nearby Nowshera asking him to send two 25 pounder artillery guns to sort out policemen. The order was cancelled by army headquarters. There was some violent streak in his personality and different interpretations have been offered. One suggests that in view of family trait of violence, he may have inherited some physical or psychological illness that made him prone to bizarre behavior. Another theory points towards his clan. Pathans are generally viewed as having short tempers and even among Pathans, pareech khels are known for even shorter fuses. The ironies of the times can be judged from the fact that before independence, Akbar portrayed himself as an ardent nationalist and had no love lost for the British. However, after independence, when he was given his dismissal order by Major General Mian Hayauddin (4/12 FFR), he wrote on the paper that he was a King’s commissioned officer and could not be dismissed even by Governor General. Long after independence, Akbar was now claiming to be the subject of the King rather than citizen of Pakistan. Latif I – Muhammad Abdul Latif Khan was a graduate of Prince of Wales Royal Military College (PWRMC) at Dehra Dun. He was from the last batch of Indians commissioned from Sandhurst in 1934. He was commissioned in 1/7 Rajput Regiment with army number of IA-262. In November 1945, he was awarded MBE and later, he was also awarded Officer of the Most Excellent Order of the British Empire (OBE). In 1947, Joint Defence Council (JDC) was formed to arrange for division of armed forces between India and Pakistan. An army subcommittee headed by Deputy Chief of General Staff (DCGS) Major General SE Irwin was formed. Latif, then Lieutenant Colonel was appointed secretary of this subcommittee. He opted for Pakistan and was appointed the first director of Military Intelligence in July 1948. He was promoted Brigadier and given the command of 103 Brigade (July 1948 to December 1949). He was promoted Major General and served as commandant of Staff College at Quetta from August 1954 to July 1957. In October 1958, when Lieutenant General Muhammad Musa was appointed C-in-C, Latif and Major General Sher Ali Khan Pataudi (7 Cavalry & 1/1 Punjab) were superseded and retired. Latif II – Muhammad Abdul Latif Khan (1916-1995) was from the princely state of Bhopal. He attended Indian Military Academy (IMA) Dehra Dun and commissioned in 1936 (IC-105). He joined 5/10 Baluch Regiment (now 12 Baloch). In Second World War, he won MC for gallantry in April 1945. He was the first cadet battalion commander of Pakistan Military Academy (PMA) at Kakul. His brother in law Major S. Bilgrami (two sisters were married to Latif & Bilgrami) was appointed company commander at Kakul at the same time. He commanded 5/10 Baluch from November 1948 to February 1949. He was commanding 5/12 Frontier Force Regiment (FFR) in 1949. This battalion is now 2FF. This battalion was part of 101 Brigade based in Kohat and commanded by Akbar. In February 1950, he was posted GSO-I of 9th Division based in Peshawar, commanded by Major General Nazir Ahmad. In December 1950, he was promoted to the rank of Brigadier and given the command of 52 Brigade based in Quetta. He was arrested in March 1951 along with several other officers for conspiracy to overthrow the civilian government. Latif’s role in 1951 conspiracy is interesting. In 1948-49, he was in agreement with Akbar about removing the civilian government. He was present in many important meetings of the conspirators. In the final plan conceived in late 1949, he was to play an important role and also to serve as member of military council after the coup. They planned to arrest Governor General in Lahore and Prime Minister in Peshawar during their visits to these two cities. Latif was then commanding 5/12 FFR in Kohat and he was assigned the task to bring two companies of his own battalion along with a squadron of Guides Cavalry to Peshawar to arrest the Prime Minister. He was present at the crucial meeting at Attock rest house on December 04, 1949. Later, he withdrew from the plan. In February 1951, Akbar wrote him a letter to clear misunderstanding between the two. The same month, Akbar came to Karachi to finalize the coup plan and asked Latif to meet him in Karachi. According to Latif, he tried to get out of the situation but when Akbar asked if he was disobeying orders, he relented. Government had some inkling about the activities of many officers involved in the conspiracy and tried to disperse some of the officers. Major General Nazir Ahmad was sent on a course to London. Akbar was asked to tour East Pakistan starting in early March and Latif’s name was added to the military mission planning to visit Iran. When Latif came to Karachi for his onward journey to Iran, he was arrested by military police. He was dismissed from the service and sentenced to prison. He was released in 1955. He led a quite life for the next several decades and died in 1995. I’m writing to you on behalf of a Delhi based Production House, AIM Television . We are making a Documentary on Kashmir for Times Network. With regards to that, I would like to take the Non- Exclusive,Global, All Media Rights in Perpetuity for the Photograph / image which has been Published on Brown Pandit website on 23.10.2016 date. Kindly let me know the right process of acquiring it. I would really appreciate if could you initiate this process asap.